Misool Manta Project: collects population and behavioural data on vulnerable manta populations. The Misool Manta Project teaches visitors to Misool, engages local community members, and conducts critical research on both Oceanic mantas (Manta birostris) and Reef mantas (Manta alfredi). The Project provides robust population data to the government, NGO’s, communities and conservationists. This data has been leveraged to push the protection of mantas and ensure the long-term survival of these charismatic megafauna as well as their habitat. Our ongoing Manta identification and satellite tagging efforts improves scientific knowledge of both resident and migratory populations of mantas. The project's photographic database has identified nearly 800 individual animals. Use of satellite and acoustic tags has deepened understanding migration patterns. The Misool Manta Project's satellite tagging data has demonstrated that both Oceanic and Reef mantas leave the Raja Ampat Shark and Manta Sanctuary. This information was presented to the national government of Indonesia, highlighting the need for nationwide protection. Our data was also used to calculate the tourism potential and economic value of live mantas versus dead ones. Thanks in large part to The Misool Manta Project's research, Indonesia created a momentous nationwide ban on Manta fishing and trading in 2014. Manta populations in Misool are of particular interest to divers as well as scientists. This is one of the only places on earth where both species of manta can be seen at the same time, sometimes even interacting. Mantas are a common occurrence on many sites within the Misool Marine Reserve. 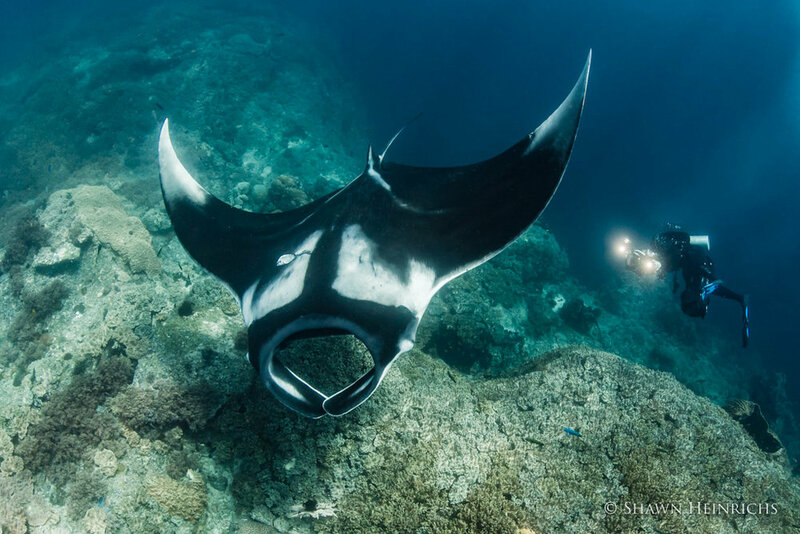 Click here to learn more about how you can dive with mantas at Misool. Discover more about Misool’s reef Mantas here.